Are you spending too much time on admin and paperwork, instead of growing your company? Outsourcing your office functions to The Occasional Assistant will enable you to run your business and concentrate on customers. 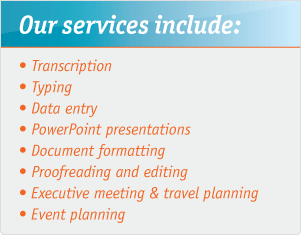 The Occasional Assistant uses their office and equipment to support your business and office needs. Work requests are received by phone, fax, email or post. All this makes The Occasional Assistant the most savvy business decision for your company.